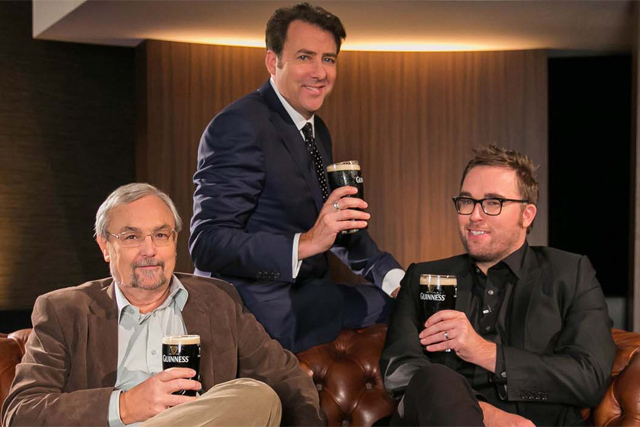 Guinness has bought up all the ad breaks within ITV's 'The Jonathan Ross Show' to showcase exclusive content about male friendship, featuring Ross and author Danny Wallace, in a deal which is said to be a first for the broadcaster. On 26 October, the Diageo-owned beer brand will take over all three ad breaks within Ross’ 10pm prime-time show in what it claims is a "unique partnership". The TV spots will comprise Ross interviewing Wallace and Oxford University’s Professor Robin Dunbar on the phenomenon of male bonding. Prof Dunbar has published Guinness-funded research on the subject and its findings will also be aired during the ads. The interview will highlight the importance of men "doing stuff" together in order to build stronger friendships – the subject of Wallace’s latest social experiment. The deal is part of an integrated marketing campaign, which will drive viewers to Guinness’ Europe YouTube channel to view Wallace’s work. Viewers will also be driven to the Guinness website to gain more information. Stephen O’Kelly, marketing director Guinness Western Europe, said: "When guys get together physically with their mates and more frequently, their friendships become stronger, better and a richer life results. Professor Robin Dunbar's research and Danny’s Social Experiment validates just this and we are proudly showcasing his work through this extraordinary partnership." In September, Diageo announced plans to invest £34 million into the marketing of Guinness as part of a plan to boost its "quality" association.